Note: The titles given to the monarchs of Aragón-Catalonia (a confederation of monarchies of which Aragón and Catalonia –also known as the House of Barcelona– were the founding states) can be confusing. 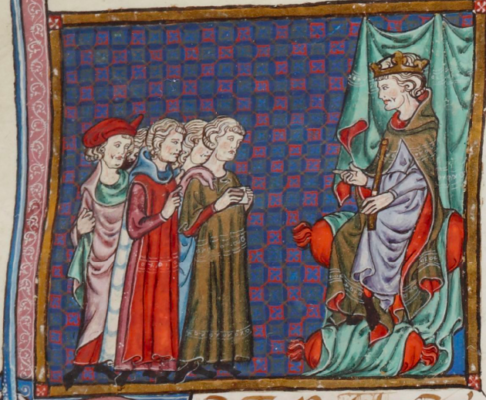 Non-Catalan historians tend to use the Aragonese chronology in numbering the kings: thus the heir to Ramón Berenguer IV and the Aragonese princess, Petronilla (whose betrothal in 1137 united Aragón and Catalonia), is Alfonso II of Aragón, whereas to Catalans he is Alfons I of the House of Barcelona! 13th-Century Monarchs: Pere I/Pedro II of Aragón r. 1196-1213, Jaume I/ Jaime I –James in English– r.1213-76, Pere II/ Pedro III of Aragón r. 1276-85, Alfons II/ Alfonso III of Aragón r. 1285-91, Jaume II/ Jaime II of Aragón r. 1291-1327. The 11th century saw the emergence of Catalonia as a major player among the early Christian kingdoms. However, its identity was threatened in the 12th century when it merged with the kingdom of Aragón following the engagement in 1137 of the young Aragonese princess, Petronilla, to Ramón Berenguer IV. From that point, Catalonia’s history was subsumed under that of Aragón although it retained its dynastic title of House of Barcelona. With its own language and laws, Catalonia had the basic infrastructure to defend its interests, and in Barcelona it had a port slowly growing in importance in the Western Mediterranean. Jaume I and Catalan Expansionism. The 13th century was one of expansion with Aragón-Catalonia’s conquest of Muslim-held lands, primarily in the Mediterranean. Here Catalans played a leading role. Jaime/ Jaume I in 16th century altarpiece in Palma de Mallorca. Under the young, energetic king, Jaume I (r. 1213-1276), they first captured the Balearic Islands (Mallorca in 1229, Menorca 1231 and Ibiza 1235) and then Valencia in 1238. Jaume next eyed Murcia, but here he ran up against the interests of Castile. After some sparring, both sides reached an agreement in 1244 whereby Jaume recognised Castile’s title to Murcia. The accord, which effectively put an end to Catalonia’s expansion southwards, has been lamented by many Catalan historians for preventing Catalonia from taking advantage of Castile’s internal dissensions and weaknesses in the late 13th and 14th centuries and challenging that kingdom for the conquest of Granada. Shut out by France to the north and Castile to the south, Catalan aspirations found an outlet in the Mediterranean. That turned out to be fruitful because Catalan ambitions coincided with the increasing importance of Barcelona as a port and trading centre. Mixing political opportunism, crusading and reconquest rhetoric, and commercial promises, Jaume I appealed to a wide constituency, from nobility to merchant. First objective was Mallorca, the largest of the Balearic Islands. Strategically placed some 200 kilometres (125 miles) from Catalonia and in hostile Almohad (i. e. Muslim/Moorish) hands, it was a serious obstacle to Catalan maritime trade, condemning it to shore-hugging activities. Justification for the attack was easy in an age of crusades backed by papal encouragement and indulgences. On a more practical level, piracy practiced by the Moors had to be overcome. What it amounted to really was that the merchants of Catalonia wanted in on a lucrative trade possibility covering the western Mediterranean at a time when there was not much to distinguish pirate from trader. By taking Mallorca, Menorca and Ibiza, Jaume I opened up the Western Mediterranean with the result that trade prospered and Catalan consulates were soon dotting the coast of North Africa from Tunisia westwards. Not only did the merchants of Barcelona benefit, so too did Catalan cloth manufacturers and wine and oil producers. In return, Catalan ships brought back gold, black slaves, paper, sheepskins, leather, wool and spices from the Barbary coast. It was a satisfying victory, and furthermore willed by God –so Jaume claimed! The conquest of the taifa of Valencia (1238) –with its rich and highly irrigated “garden”– from the Muslim Almohads, was also satisfying but posed a problem. Over the objection of the Catalans, many Aragonese nobles wanted to incorporate the newly conquered land to their kingdom and its fueros (privileges). To neutralise these demands, Jaume elevated the region to a kingdom endowing it with its own fueros (which were much like those of Catalonia). It is from this moment that Valencia forms the third confederate member of the **Crown of Aragón. At the same time, Jaume came to an agreement with the Muslim population that they could retain their religion and customs. It was a pragmatic arrangement since the Christians lacked manpower to take over the land and, importantly, the Muslims were expert workers of the fields and vital to the economy of the region. Jaume I’s initiative in expanding Catalonia’s territory and its trading contacts was accompanied by a surge in the importance of the Catalan language, akin to what was happening to other Romance tongues. Although Jaume’s contribution may be considered less profound than that of his son-in-law, Alfonso X, in Castile, Jaume made Catalan the working language of the court, and gave it added impetus by penning –or probably dictating– his autobiography, the Llibre dels feits (Book of Deeds), in Catalan. The lives of kings were normally chronicled in Latin, but Jaume’s decision to write in Catalan conferred on the language immediate prestige through association. “Great deeds” were no longer the domain of Latin! Jaume was also influential in the compilation of the Llibre del Consolat de Mar (1283 Book of the Consulate of the Sea), a manual of maritime law governing trade in the Mediterranean. Jaume I’s reign was not without internal dissensions and rebellions; nothing unusual in the uncertain world of Medieval Europe. He did not help the cause of unity when he divided his kingdom upon his death that in time led to smaller kingdoms –Mallorca, Sicily, Naples– which frequently had different agendas even when they all recognised the king of Aragón as the head of the dynasty to which they belonged. It was a family division, but family interests did not always coincide, even between the elder members, Aragón and Catalonia. Undoubtedly, the general primacy of Aragón-Catalonia as the driving force behind the politics of expansion, and strong-minded monarchs provided the impetus and formulated the policies. Dynastic rights were probably paramount in the monarchs’ minds, but such concerns went hand in hand with the commercial interests of the merchants of Barcelona (it helped too that the crown was also involved in commerce). The result was a fortuitous merger of interests that benefited the city so that by the 14th century it could compete with the already established Western Mediterranean cities of Genoa, Pisa and Marseille in the trading wars in the Mediterranean. Pedro III of Aragón giving audience. A major step in the expansion of Catalan interests was the marriage of Jaume I’s oldest son, Pere II (Pedro III of Aragón r. 1276-85), to Constance, the daughter of the Germanic king of Sicily, but it was a union that brought Catalonia directly into conflict with other interests –French, German and papal. A French invasion of Sicily in 1266, urged by the pope, led to French occupation of the island. Discontented with French rule, the Sicilians rebelled in 1282 and sought out Pere II’s help. Pere answered immediately by invading the island in the name of his wife and claimed the throne for both. At this point the kingdom of Sicily became part of the Crown of Aragón and the growing Catalan “empire.” Equally important the island was a major grain producer, a fact that was not lost on the merchants of Barcelona, some of whom helped finance Pere’s conquest. Soon after, Catalonia turned its attention to Sardinia, like Sicily rich in grain as well as salt and silver. It was also a strategic post for Barcelona’s rivals, Genoa and Pisa, so that Catalan control would clearly hurt the two Italian city states. By 1324, Sardinia was in Catalan hands, but being a very large island, it was never effectively controlled, and numerous rebellions over the years –abetted by the Genoese– were very costly in Catalan lives and money. As a result, it never became anything more than a colony, a savage land with its inhabitants despised by the Catalans and sold into slavery whenever possible. Beyond Sicily, Catalan presence was less notable. There were diplomatic contacts with Egypt and Constantinople, but territorial gain was limited to the duchy of Athens. However, this conquest, in 1310, was not the result of royal or commercial sponsorship but initiated by a band of Catalan mercenaries of the so-called “Catalan Company” whose political link with Aragón-Catalonia was tenuous, since it fell under the authority of the Kingdom of Sicily. It appears to have produced little commercial benefit. All in all, Catalan expansion by the early 14th century was impressive: Mallorca, Ibiza, Menorca, Sicily, Sardinia, and its sphere of influence especially extensive in the Western Mediterranean. Not only did it have trading links with numerous North African cities, it also –following reconquest practice within the Iberian Peninsula– exacted tributes from many (e. g. Tunis) in return for protection or as payment for troops or ships. It might have been tempting to consider conquest, and establishing a Catalan colony for the greater glory of Christendom, as some of the chronicles of the period urged; that certainly was a powerful image, but in reality the logistics of distance and lack of manpower made that impractical. Barton, Simon A History of Spain New York 2nd ed. 2009. Eaude, Michael Catalonia: A Cultural History Oxford 2008. Mestre I Godes, Jesús Breu historia de Catalunya Barcelona 1998.